Game Design And Other Things is a GameJam game that I created for GiftJam 2017, a gamewhere where you need to make a game specifically for someone to give them as a gift. I decided to make a game for one of my coworkers, and it's a parody of sorts of what their daily job could look like. Although it's a bit silly, the core message of the game is that they're a good person and chatting with them gives me motivation to go through my work days. It's not a very complex game; you have four simple minigames and a few more things you can interact with for flavor, and it has a small tutorial that then becomes an endless survival kind of game where you have to accomplish tasks without losing too much motivation yourself. The core of the game is a daily structure where you have to work from 9 to 5 at your Game Design job, this takes about 2 minutes in real time. The beginning of the game has you do 'Game Design', then progressively more tasks get introduced. You have to upload videos, edit them and chat with your bosses. One new mechanic gets introduced for each minigame after a while, and after day 15, you're on your own. GAMEDESIGN.EXE: To game design, you have a palette of tiles with colors on each side, you need to place them on the grid and make sure that the sides match. If they don't, you lose motivation. After a while your boss comes in to 'help' you and places tiles randomly. 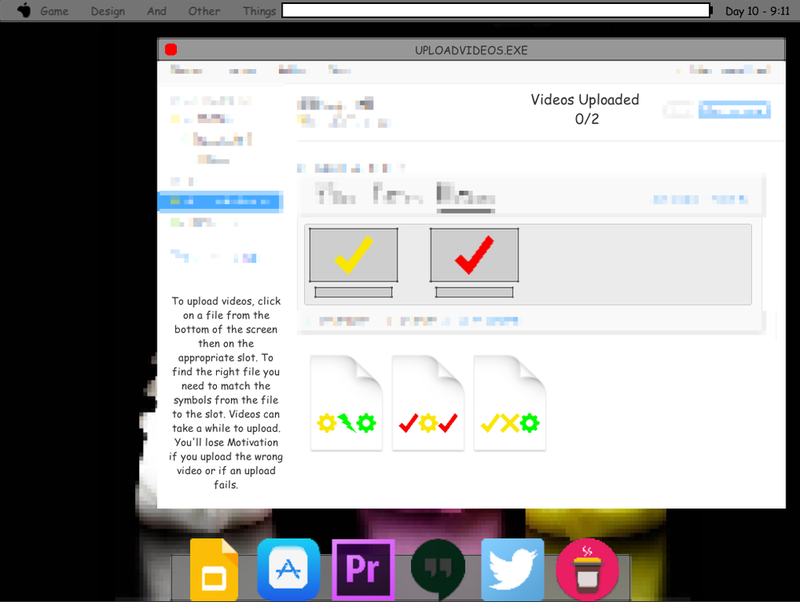 VIDEOUPLOAD.EXE: To upload videos, you have a list of files with 3 symbols on them and slots with rapidly changing symbols, you need to match the files to the slots. After a while, uploads can randomly fail and you have to click on them to resume the upload, Thanks Steve! 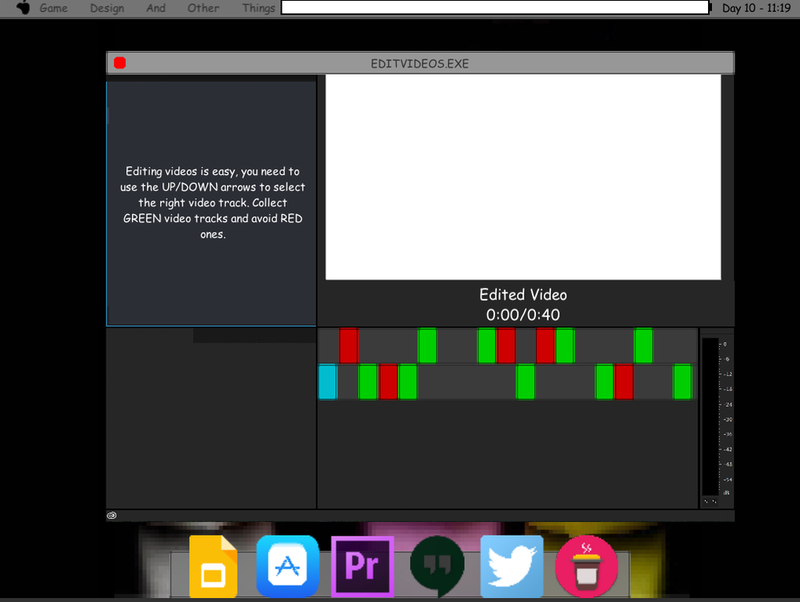 EDITVIDEOS.EXE: To edit videos, you have multiple tracks with red and green bars coming at you, you need to move your marker to hit the green bars and dodge the red ones. After a while there is also audio to be edited, so you need to control two markers at the same time. 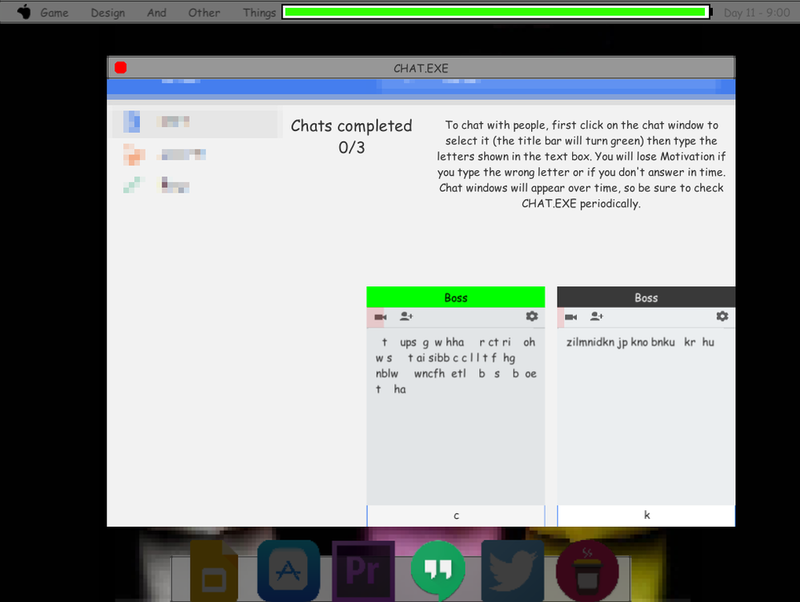 CHAT.EXE: To chat with your bosses, you simply need to type specific letters in their chat box. After a while you also get chats from coworkers, completing those gives you (and them) motivation. SOCIALMEDIA.EXE: Use this app to make time fly by really fast. Useful when you're bored. Coffee: Not an app, but you still get one coffee every morning. Drink it to make yourself immune to damage for a short while.